One second of meditation is better than 50,000 years of prayer. 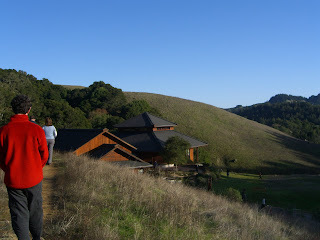 I spent 7 days last week in silent meditation with about 80 other neuroscientists at Spirit Rock Meditation Center. The group was led by 4 leading western Buddhist meditation teachers, Guy Armstrong, Silvia Boorstein, Jack Kornfield, and Sharon Salzberg. Among the group was a scientist and several members of his lab, you may have read/heard about, who are doing functional MRI studies on Buddhist monks to determine the effects of meditation on brain structure. 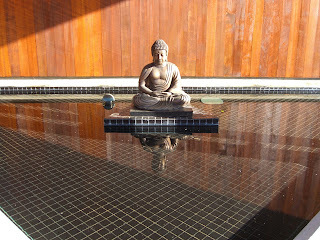 The retreat seemed to blend modern neuroscience with ancient inquiry into the mind. 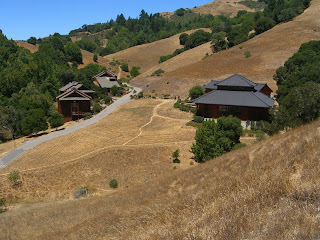 Despite the beautiful retreat center located on 420 acres in Marin, it was a rigorous and fairly austere week. We went into "silence" the first evening and did not speak for most of the 7 days except on rare occasion to a teacher or staff member. 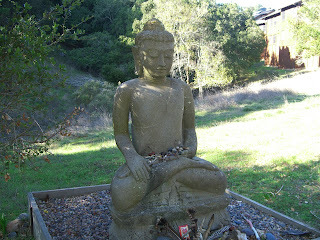 We were awakened at 5:15 AM and were sitting in meditation by 5:45 AM each morning. We then alternated sitting and walking meditation until 9:30 PM, breaking only for eating meditation and work meditation. There were typically 2 lectures a day, a morning instruction on meditation technique and an evening Dharma talk (Buddhist teachings). Briefly, for those who may be unfamiliar, the sitting meditation style taught involves sitting very still in one of several meditation positions with a straight back, eyes closed, and focused attention on the breath. Breathe in -- notice the air rush past the nostrils to the lungs, filling the chest ... breath out -- notice the breath rushing out. Focus on a single point of deepest sensation and notice every breath. Allow thoughts and emotions to pass and return to the breath -- always return to the breath after each distraction. The challenge is to stay focused on the breath despite the mind's "popcorn thought machine" -- it was difficult, especially for the first few days. Walking meditation involved a very slow, deliberate walk (inside or outside) with all attention placed on each movement of every step: lift, shift, step, lift, shift, step, ... all at pace that made us appear to be living/dead zombies roaming the Center walkways and paths. It was more difficult to appreciate this, but it was a welcome relief from sitting and the weather was beautiful, so I stayed with the program. A typical day included roughly 7 hrs of sitting meditation, 4.5 hrs of walking meditation in addition to the Dharma talks which we also recieved while sitting on our zafus. By day 3, my back ached from sitting so much - it was almost unbearable -- at times I (and many others) simply had to stand in the meditation hall to complete a session. We were encouraged to stick with it and told that it is common to uncover points of pain and resistance in the body as we unfold. I was discouraged from even taking aspirin or ibuprofen so as not to dull the sensation. Let the mind settle, allow the body to settle, go deeper ... unfold ... deeper. After 3 days of meditation, I reached a very expanded state. I could close my eyes and feel a very large universe surrounding me. I felt integrated in that universe, aware, and a bit enlightened. By the 4th day, it was evident that we had settled, as individuals and as a group. The sittings were no longer as painful, it was easier to stay with the breath for much longer periods, and my mind was noticeably calmer. There was a crystalline texture in the air -- everything looked vibrant and energized, sounds were clear and crisp. 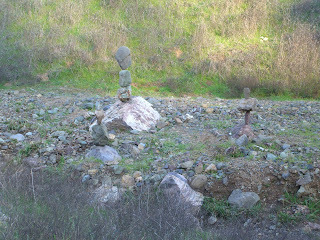 I began noticing little things -- leaves, stacks of rocks, a grasshopper on the path (in January?). At this point, we were instructed to allow ourselves to feel emotion -- start with attention on the breath, but allow it to expand to include emotion. I remember rolling my eyes a bit at the instruction -- I don't consider myself to have a lot of emotion, so this didn't seem to be much of an exploration for me. But, amazingly, I closed my eyes to begin the sit and a story unfolded almost immediately -- tears were running down my cheeks as I sat there among 80 other scientists, physicians, and therapists. I was in disbelief, but I stayed with the moment and let it unfold over what was probably only a few minutes. Then, it felt "out" and I settled further. On the 5th day, we were instructed to allow our minds to go with our thoughts. This was more exciting to me. My mind was clear - almost devoid of chatter - and thoughts seemed linear and profound. I proceeded eagerly to solve business issues, relationship issues, personal growth issues -- basically, any problem that arose was resolvable. I had lots of fun with it. More than any other part of the retreat, this revealed to me how simple life truly is. Aside from those events that we can't control, we only make it hard on ourselves. On the 6th day, we started the transition back up - there was a sensation of surfacing from a deep dive. I had been so apprehensive about how I would tolerate a week of sitting in silence, but by then, I was very sorry the experience was slowly and deliberately ending. 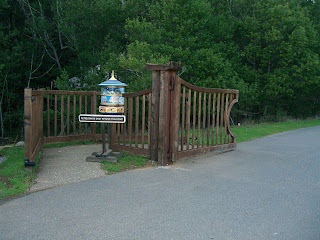 Walking out through the gates on day 7, I felt like a monk leaving the monastery for a life in the outside world.